A delicious and filling South Indian upma that is suitable as an evening snack, lunch box item, breakfast dish or even a weeknight dinner. 1. Dry roast the rava in a pan until golden. 3. Fry the mustard seeds, curry leaves and urad dal for 30 seconds. 4. Add the onions and saute for 2 minutes. 5. Add the mixed vegetables and green chillies. 6. Pour 1 1/4 to 1 1/2 cups of water and stir well. 7. Add the rava and salt to taste. Stir well. 8. Simmer for a few minutes or until the moisture has almost evaporated. 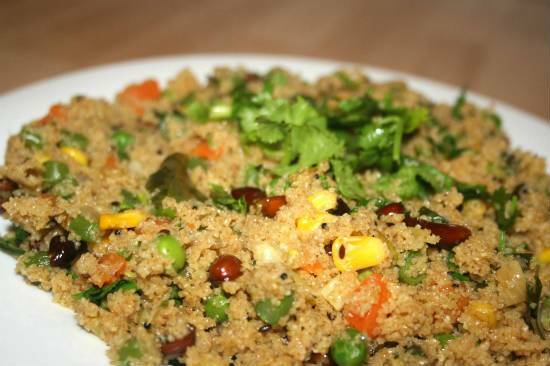 Feel free to comment or share your thoughts on this Samba Godhumai Rava Vegetable Upma Recipe from Awesome Cuisine.